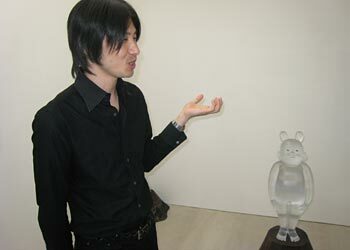 Mr. Koichi Matsufuji is a glass sculptor. I met him for the first time in Denmark, during the prize giving ceremony of the competition "Young Glass" organized by Glasmuseet Ebeltoft. With his "Baby with silver folded paper crane" Mr. Matsufuji won the Holmegaard Prize, one of the four prominent prizes of the event. 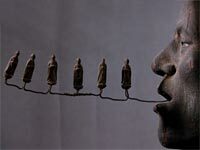 that the work of Mr. Matsufuji had the strongest Japanese character among the exhibits of the Japanese artists. 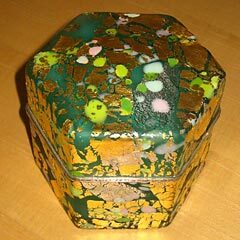 As I was not familiar with glass arts by then, I was surprised by the variety of works of participating artists. Before I saw the exhibits, I had only imagined that glass works were some things which had certain practical purposes such as containers, cups and vases. But, the displayed works were mostly abstract art objects. 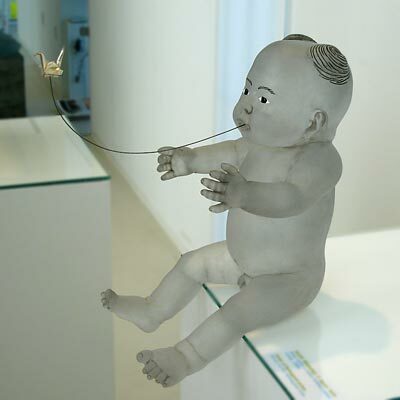 Among them the work of Mr. Matsufuji, a naked male baby, was one of the most representational works. 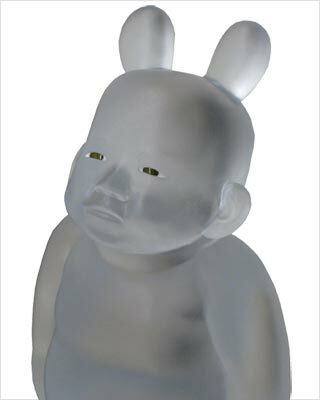 Though, the plump body well expressed the real flesh of a male baby, its somewhat solemn face and dark translucent cast glass body told us that the baby did not simply represent an innocent creature. It could be a religious statute, such as a statute of Ksitigarbha, a bodhisatva known in Japan to guard children. A crane, in the traditional origami style, flew in front of his face, as if a part of his spirit took a shape of crane and was spit out of his mouth into this world. On my question, Mr. Matsufuji explained that he obtained this idea when he saw the famous wooden sculpture of Kuya in reciting mantra. So, my impression was not wrong. In this October, he had his first exhibition in Tokyo. Because he is based in Nagoya, he had not shown his works in Tokyo. However, Gallery Cellar took up his works and he made his debut in Tokyo. This time, his babies were accompanied with butterflies. Two bunches of hair on the baby's head changed their shape and looked like the years of Micky Mouse. The mysterious expression of small and heavy babies had been further strengthened and they gazed at something very distant thing, maybe the polar star, as the title of the exhibition indicated. This change was created by elaborating the eye-expression. Several pictures of the same motifs were also displayed and because those pictures were painted with the dark universe in the background, they strengthened the mysterious image I got when I saw the glass babies. The mysterious mood was related to the destiny of humans, their lonesome and solitary existence. There was also a tiny glass bear among the exhibits. It might be the Little Bear. Like his glass birds, this bear looks somewhat more cheerful and harmless than his babies. When I was there, all babies had been already sold out. It seemed that there were enough number of people who were enchanted by the allure of the babies and wanted to possess one.